The day plan had a Demul to Komik trek in agenda. Next day was the day for Safari from Demul to Komik. We were to assemble at the village’s meeting point at 9:00 am. We collected our luggage, tiffin-boxes (packed by our hostess) and bid the family good-bye. Our respective modes of transport were parked at the assembly point already. In my case, it was a yak, while my roommate’s was a horse. All of us assembled at the designated spot and waited for our guide to be back from arranging a back-to-Kaza transport for one of our travel mates who had suddenly taken ill with HAS (High Altitude Sickness). When Anjaan (our guide) returned, he explained us the technicalities involving a yak ride. There were 5 of us on yaks, while 3 on horses. After internalizing the yak-ride-science, I gathered that we would be sitting on this animal (with breaks at regular intervals) for 5 hours; 14 kilometers, Demul to Komik, the trek-distance. As we started our safari, I spotted our guide trekking the way with a backpack strapped on to his bag. It surprised me that he chose to walk and not ride. I asked him the reason and he told me that since he is a practicing Buddhist, his religion and conscience does not allow him to ride an animal for any reason what-so-ever. This surprised me a lot! I then offered to hold his bag while riding on my yak and he said “This is my burden and I see no point as to why some other living being be made to suffer for it.” That made me wonder why I was making the poor yak suffer because of my own 75 kgs. I suddenly felt extremely horrible for undertaking this cruel activity in the name of adventure. Just 3 kilometers after leaving Demul, we came across a bunch of trekkers from Scotland, who were trekking from (hold your breath) Kaza to Demul, via Komik. I had a fleeting urge to get down from my yak and pay them some kind of respect. On the way, the two major things that took me by surprise were the landscape and the weather. When you start from Demul the landscape is green and rocky. While after approximately six kilometers of distance, it gradually changes to a land of no vegetation with soil all around. The terrain too changes according to the landscape. At many places, the walk-way for yak was no more than a foot and a half wide wedge. It is risky because if your yak slips or decides to throw you off, you go down a very steep slope. Thankfully for us, neither happened! One of us had his yak slipping off the course briefly before getting back on track. But those 15 seconds had our hearts clutched. So, with 3 short breaks and one lunch break we covered around 10 kilometers of our safari. A word about the weather – The weather in Spiti is extremely unpredictable, and we had internalized this fact by the time we were to do Demul-Komik Safari. But this was totally new for us, and we were not prepared for this. We had sun blazing down on us for one hour after we left Demul, coupled with cold breeze from the snow capped Himalayas. After an hour, it suddenly was very cold and I had to put on my jacket. There would be times when it would be very hot (because of the sun) and very cold (because of the breeze) at the same time. It confuses your system badly and wears you out. After half an hour, the sun shone down on us like insane for another 45 minutes. One more sequence of icy-cold-wind-and-sun-shining madly down upon us later, the sky quickly became overcast. And it began to rain, coupled with icy cold winds from the majestic Himalayas. It rained continuously for 20 minutes and that was when my yak decided it had had enough of me and flipped me on to one side. I landed with a thud on the ground while the yak ran the other way. The best thing about this sequence was that it did not decide to flip me onto the downward slope (I shudder to imagine the consequences if it had done so), nor did it run me over after throwing me off. I had internally injured myself badly. Or so it seemed, because of the pain. Our guide decided that everybody could continue with the safari and I would walk if I could and wanted to. The place where our bus was parked was still 3 kilometers to go. I sat down and drank some water and contemplated that if I sit down with the injury, it might clot the blood and pain much more later. So I told Anjaan that I’ll walk for as long as my injury permitted. We walked a distance of 20 steps from my accident site and we saw our group clicking pictures and tipping the yak pullers. In short, bidding them good-bye. Turned out, they reasoned that they felt that the bus could be called to collect me and even they would terminate the safari there itself. Our guide then sent two horse-pullers on horses (no cell-phone, remember?) to inform our bus-driver to come and pick us up from where we were. We decided to walk, till the time we met our bus half-way through. We soon came to know that because of an ongoing road-construction, the bus could only reach till a point that was still 2 kilometers away from the point we were at. We walked the distance and boarded the bus. I had insane amount of pain troubling me. The drive to Komik village took 20 minutes from where we had boarded the bus. 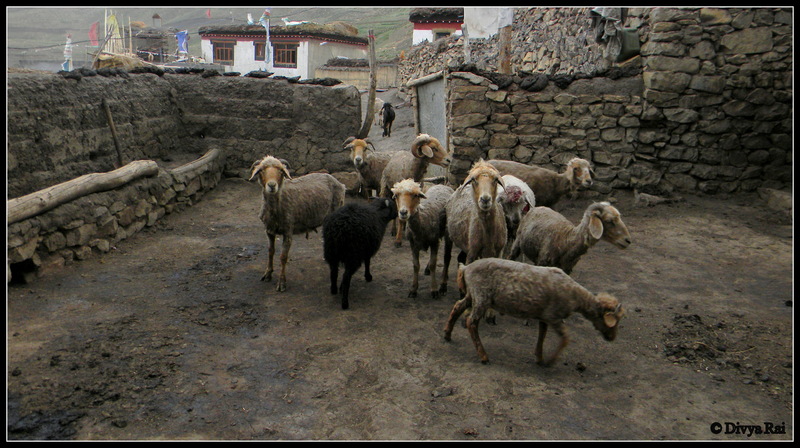 Komik Village is at a height of 15000 ft above sea level and is the highest village with a motor-able road in Asia. The air here is fairly thin and you do feel slight breathlessness. We reached Komik and once again our new hosts were there to pick us up. This time, the road to my home-stay was a mini-trek in itself, with it being the house at the highest height ( and farthest off) in the village. I think Anjaan secretly thought that I needed to lose weight and hence allotted me home-stays that were highest or farthest, or worse, both. As we began to walk up the hill along with our luggage, our hosts offered to carry it for us. I did not feel that it would be right to burden the host for it. It is here that one understands the importance of packing right things in the right way. It is here we learn that packing sachet instead of the entire shampoo bottle can suffice. Besides, it also adds to the roughing-it-out experience of travelling. Komik has 13 houses in total. By the time we reached this village, our sense for weather had gone for a six and we were completely worn out. One of us had dehydrated himself and was a little worse. We reached our beautiful room and quickly decided to take a nap. It was 5:30pm. The lady of the house was out in the fields and we were welcomed by the man of the family. He made us tea and looked after our requirements with surprising ease with domestic life. I slept for an hour and a half and got up, as I did not want the nap to eat into my night-slumber. I took a walk around the place.Thankfully, we had our toilet right next to our house, unlike some of my pals who had it like a mini-trek. I took a stroll outside my house and saw another of my travel-companion hanging around outside her place. Our houses were at a distance of 100 meters from each others. We decided that we would quickly visit another house in the vicinity (that was hosting two of our travel-mates) which was some 150 meters from my house. To co-ordinate this, we had to shout to talk to each other (no other means of communication) and it was fun. I think the entire village could hear (because of the echo) that we were planning to visit another of our travel -mate. We went to see our friends and spent some time with them. Their host-family answered our various questions regarding the village life, women-healthcare in the area, education and medical facilities. The family was extremely kind and generous with their time and information. I could sense that as the answer to some questions, they would go totally silent as if they had mentally come to a dead-end. As if we did not get their perspective and problems. Maybe we did not. After spending 45 minutes with them and downing an amazing cup of tea, we decided it was time to head home as it was getting dark and both of us were not carrying our torches with us. It made sense to reach home while there was still some bit of daylight left. The way to our respective houses was a one foot wide wedge on the hilly slope. I reached home and saw that my roommate was up and about. The lady of the house was back from the fields.The cows and the goats were home too. Evenings there had so different a meaning as compared to our urban life. We requested our hosts for a second kettle of chai. Dinner was ready by 9:00 pm and we had it just as it was served. We had this amazing daal-rice- vegetable, cooked exactly like we, in the plains do. I think by then, each one of us was a bit homesick and the dal-rice fare only soothed the psyche. The most noteworthy factor was the fact that the men and the women, both managed fields and the home with equal ease. There was no area that was solely a woman/man’s responsibility. In this respect, they were more broad-minded and progressive than most of the so-called educated city-dwellers I have known. The couple had a cute 5 year old daughter who studied in a school which was at a distance of 2 kilometers from Komik. The 2 kilometers trek from Komik to wherever is like 5 to 7 kilometers on the plains. The little girl walked the distance. That information had us stop the getting-to-know-each-other-better-round right there and silently thank God for the life He had chosen to give us. The family had a beautiful, forever-hungry cat as a pet. Apart from, of course, other animals like cows, goats, etc. In our urban life, the cat meows next to the refrigerator for milk, while this one meowed to glory right next to the cows. Post-dinner, we again immediately hit the sack as if we had carried the yaks on our backs and not the other way round. For some strange reason I had a very sleepless night in Komik. I should have known, as mine and my roommate’s sleeplessness followed a pattern.I was sleepless partially because of the horrid pain from the yak-fiasco. I was so tempted to photograph the village from my house as it was a pitch dark, beautiful night. The clouds had completely covered the moon and that added to the darkness. Twice, I walked out with my camera and tried to capture what I could see and feel. Well, that was not to happen with my P&S camera as it has its own limitations. At 2:30am, I finally gave up and slept. It is a beautiful trek. Both the villages are very unique experiences! Both the villages have home-stays with dry compost toilets. These are tricky to use if you have never used Indian toilets. The trek is slightly precarious. Komik has high altitude, hence chances of AMS are high.